"RW Aur A is a classical T Tauri surrounded by an accretion disk. It's a visual binary; the B component is fainter and shows no sign of a disk. The separation is 1.4 arcsec, but the B component is so much fainter (V = 13.6) that it's not a problem if the binary is not resolved. "In fall 2014 (we don't know the exact date) RW Aur A become dimmer by about 3 mag in V band. This can be seen e.g. in the AAVSO database [use www.aavso.org/lcg or see below]. The current best idea of what causes this dimming is that the secondary component RW Aur B has passed by the disk of RW Aur A and pulled mass out of the disk into a stream or cloud that now covers up part of the light from RW Aur A. The orbit of the binary is > 100 years, so we don't expect this to happen again any time soon! "We want to use this opportunity to measure what this stream is composed of. What is the ratio of gas and dust? What is the size of the dust grains? "The way we attempt to do this is to observe RW Aur A in as many different bands as possible...The Chandra X-ray satellite will observe RW Aur A for 11 hours. The satellite operations team is currently working on the schedule, so we don't know exactly when these observations are going to happen, but we expect that they will likely take place sometime during April 6-12, although possibly sooner. X-rays are absorbed by all material between the star and us - the gas and the dust. "In contrast, optical reddening is only due to the dust around the star. If we compare the two, we can calculate how much of the mass in the tidal stream is gas and how much is dust. "Thus, we ask [AAVSO observers] to observe RW Aur in the next few weeks (as long as it is still visible) in as many bands as possible...It would be great to have a dense lightcurve (at least one point per night in as many bands as possible (incl. JHK if possible)) for the next few weeks. We expect it to be stable, but if anything funny (flares, further dimming) happens then we need to know about it, so we can see how that would affect the X-ray observations." RW Aur normally varies between about 10.3 and 11.0 visually, although it can be as bright as 9.8 and faint as 11.7. Recently, it declined to 12.6 by 2014 October 28, and it was visual magnitude 12.4 as of 2015 March 23. In August 2010, RW Aur declined to visual magnitude 12.6, returning to mag 10.5 in April 2011. A light curve of RW Aur observations in the AAVSO International Database may be plotted using the AAVSO Light Curve Generator (www.aavso.org/lcg). A recent AAVSO light curve of RW Aur may be seen here. Please observe RW Aur nightly in as many bands as possible through the end of the current observing season. Visual observations are welcome. 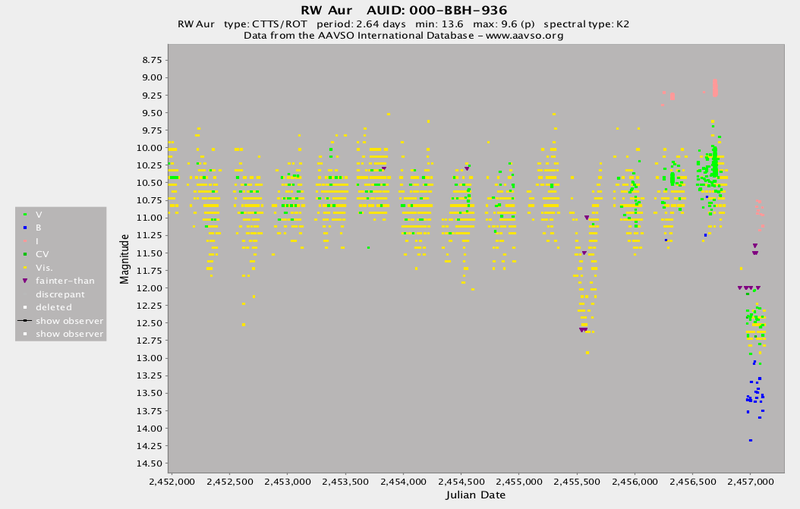 Charts for RW Aur may be plotted using the AAVSO Variable Star Plotter (VSP, http://www.aavso.org/vsp).